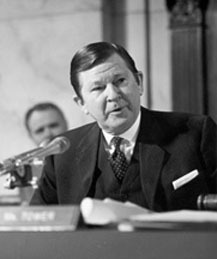 After service in the Senate (including Chairman of the Armed Services Committee for several years), Tower became a highly paid defense consultant. In 1986, Ronald Reagan appointed Tower to investigate the Iran-Contra scandal. He was also nominated to U.S. Secretary of Defense by George H.W. Bush, though not confirmed by the Senate amidst a firestorm of allegations regarding his womanizing and heavy drinking.